In last month’s Market Report newsletter, we gave our assessment that San Francisco single family home sales prices had peaked early this year and were starting a correction. We now have another price decrease from July to August and are off 9.5% from the peak in February. This represents a significant price correction in the single family home sales market. 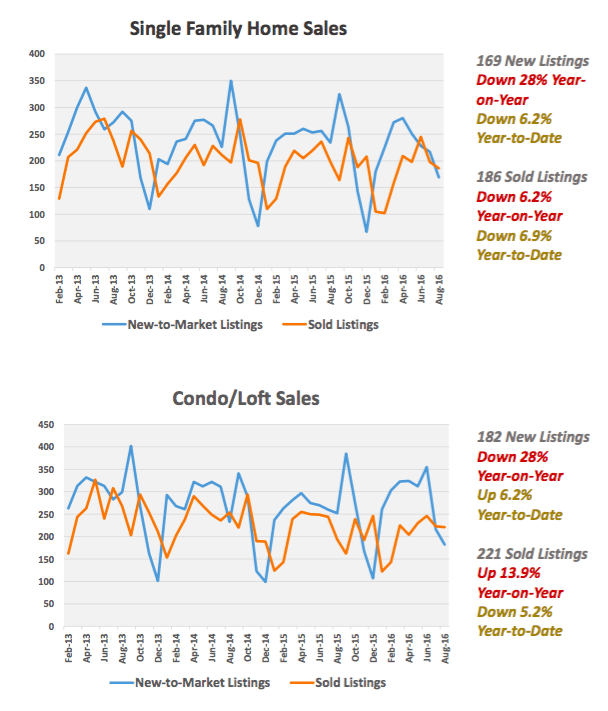 Likewise, we predicted that hindsight would show that the condo/loft market had peaked this past June – we stand by that. August is a bit above July but down 6.5% from June. 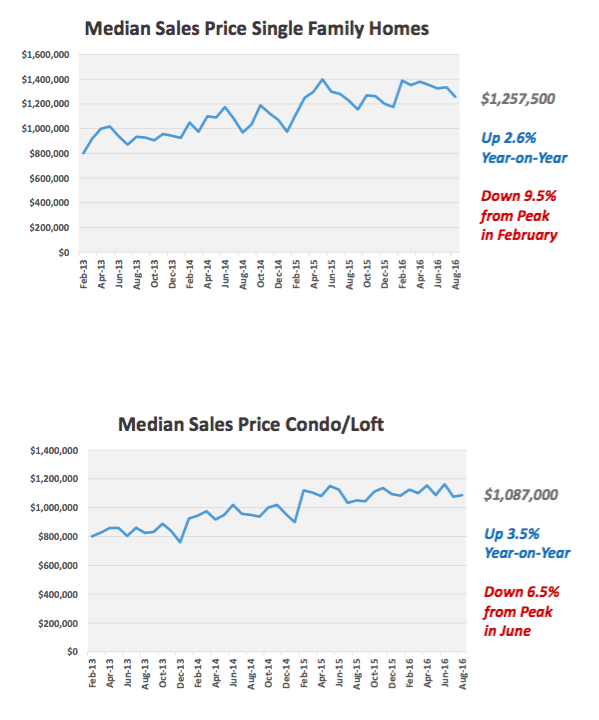 With more and more condos coming on the market, sold prices will continue to weaken. The number of sales of single family homes was the lowest August for the past 10 years – just 186 sales. Year-to- date, the number of single family home sales is 1401, down 6.9% for the year, and the fewest sales since 2009. And, as happened last month, the number of new-on-the-market single family home listings continues to be lower than in 2015, now off 6.2% year-to-date. The number of months of inventory of condos/lofts city-wide has stayed above 2.6 for the past five months, reaching 2.9 in June and July, a territory it hasn’t staying in since mid- 2012. District 9 is even higher, up 50%, with a 3 month’s supply, the highest since July, 2012. 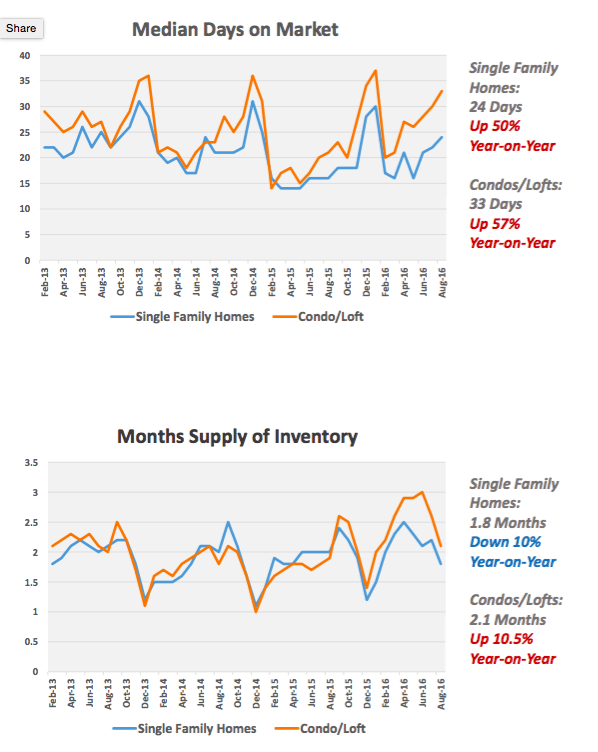 Again, months of inventory is rising in the condo/loft market because the number of units selling is less than the number of new listings coming on the market.